New Plaque Marks Mentryville's 125th. Califonria's oil industry was born in this canyon on this date 125 years ago when Charles Alexander Mentry brought in the state's first successful oil well. More wells soon dotted the canyon and the oil was sent six miles east to the state's first productive refinery at Newhall. Workers established California's first oil town on this site, which would be called Mentryville. The oil boom petered out after the turn of the 20th century but Mentry's famous "Pico No. 4" remained in operation until 1990. At that time, it was the oldest producing well in the world. he Friends of Mentryville placed a plaque Wednesday morning, commemorating the 125th anniversary of an oil gush from Pico No. 4, the first commercially successful oil well in the Western United States. The plaque was placed in time for the historic town of Mentryville to celebrate its Fall Harvest Festival on Saturday. "The neat thing about this town is that you come down the road and go from the 21st century to the 19th century," said James McCarthy, president of Friends of Mentryville. "We're a group that's into remembering, and we haven't forgotten about what happened on Sept. 11 (2001). We also haven't forgotten about the history of this valley." "We hope that people can take a break from the current (national) tragedy and step back in time with us on Saturday," McCarthy said. Mentryville was established by oil workers who migrated to work on the well, and by 1880, about 100 families resided in the town. The oil boom began to taper off by the turn of the century, but Pico No. 4 kept running until 1990, making it the longest-running oil well in the world at that time. Saturday's fair will give visitors the chance to step back into the time of the old days of Mentryville, offering antique automobiles, a barbecue and entertainment that includes cowboy poetry by Chuck Powell, a barbershop quartet, Canyon Theatre singers and the Leasebreakers Jug Band. There is a requested donation of $1 per person to get into the fair, and donations will help restore and buy artifacts to furnish the historic structures of Mentryville. 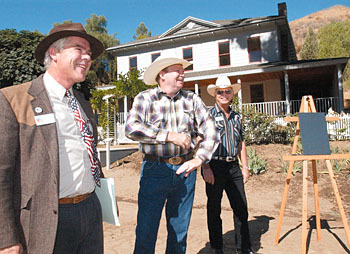 "The city of Santa Clarita is as interested in protecting our future as we are in protecting our past," said Duane Harte, a director for the Friends of Mentryville. "When we look back at the things that took place in the 1850s and 1860s, the things that put this town into fruition, we want to keep it safe from development," he said. "This is our love," Harte said. "This is our passion." The festival will also feature pumpkins, handmade crafts, popcorn, cotton candy, artisans, sno-cones, corn stalks, and fun and games. The Mentryville Fall Harvest Festival will run from 10 a.m. to 5 p.m. Saturday in historic Mentryville, located at the end of Pico Canyon Road. For more information, check the Mentryville Web site at www.mentryville.org, or call 255-2695.